Growing construction market, expansion of metros & airports, upcoming new hotels & malls and growing Metal & Mining sector are the few factors that have resulted in the growth of Construction Equipment market in Saudi Arabia. Further, growth in government expenditure on infrastructure development have impacted for the wide utilization of Construction equipment in the construction industry across Saudi Arabia. According to 6Wresearch, Saudi Arabia's Construction Equipment market is projected to grow at a CAGR of 8.75% during 2015-21. In 2014, loaders accounted for 28.8% of market share in overall market followed by crane and construction tractor. During 2015-21, share of loader is expected to increase further to reach 34.5% growing at a CAGR of 11.6% by 2021. Amongst all verticals, construction vertical accounted for total 52.6% of the market share and is expected to dominate in the forecast period due to growing investments in the country. The report thoroughly covers the market by Construction Equipment types, by verticals, and by regions. The report provides the unbiased and detailed analysis of the on-going trends, opportunities/high growth areas, market drivers which would help the stakeholders to device and align their market strategies according to the current and future market dynamics. • Historical data of Global Construction Equipment Market for the Period 2010-2014. • Market Size & Forecast of Global Construction Equipment Market until 2021. • Historical data of Saudi Arabia Construction Equipment Market Revenue & Volume for the Period 2010-2014. • Market Size & Forecast of Saudi Arabia Construction Equipment Revenue & Volume Market until 2021. • Historical & Forecast data of Saudi Arabia Crane Market Revenue & Volume for the Period 2010-2021. • Historical & Forecast data of Saudi Arabia Excavators Market Revenue & Volume for the Period 2010-2021. • Historical & Forecast data of Saudi Arabia Loaders Market Revenue & Volume for the Period 2010-2021. • Historical & Forecast of Saudi Arabia Construction Tractors Market Revenue & Volume for the Period 2010-2021. • Historical & Forecast data of Saudi Arabia Motor Grader Market Revenue & Volume for the Period 2010-2021. • Historical & Forecast data of Saudi Arabia Telescopic Handler Market Revenue & Volume for the Period 2010-2021. • Historical & Forecast data of Saudi Arabia other construction equipment Market Revenue for the Period 2010-2021. • Historical data of Saudi Arabia Construction Equipment Regional Market Revenue & Volume for the Period 2010-2014. • Market Size & Forecast of Saudi Arabia Construction Equipment Regional Market Revenue & Volume until 2021. • Players Market Share and Competitive Landscape. Saudi Arabia Construction Equipment Market is projected to grow at a rate of 8.75% during the forecast period on account of growing construction market, expansion of energy sector with several projects, expanding public & private infrastructures and surging investments. Saudi Arabia Construction Equipment Market is highly import driven and consolidated market with few global players accounting for majority of the market. International players are increasingly making their footprints in the market through partnerships or distribution. 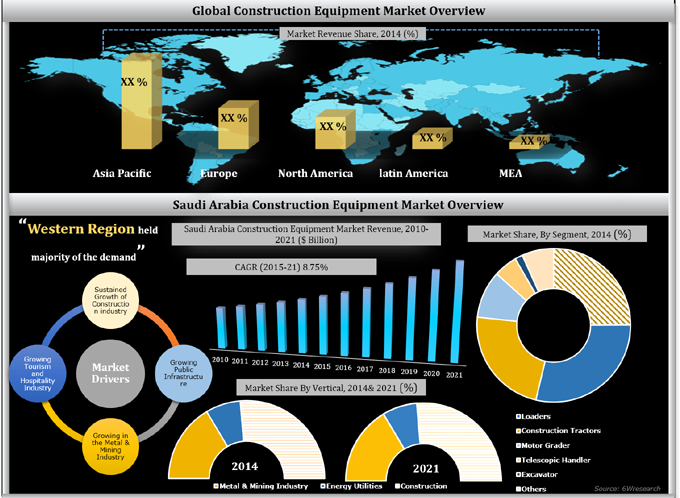 Saudi Arabia construction equipment market report has been segmented into equipment types, end user applications and regions. The major companies in Saudi Arabia construction equipment market include- Caterpillar Inc, BEML Limited, AB Volvo, Komatsu, Hitachi Construction Machinery Limited, Mitsubishi Corporation and JCB.